We’ve written about tea-tree oil before, and listed ten of its key uses. That was a very popular article so we thought our readers would appreciate more information on this important essential oil. We did a lot of investigation and came up with some really interesting applications. Here’s some background on tea tree oil first though – if you are familiar with this already, you can just skip to here. 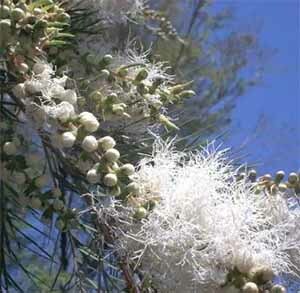 Australian Aborigines have used the leaves of the indigenous Melaleuca Tree in their medications for centuries. They inhaled the oils from the crushed leaves to treat coughs and colds, sprinkled crushed leaves on their wounds, and used an infusion of soaked leaves to treat sore throats or skin ailments. 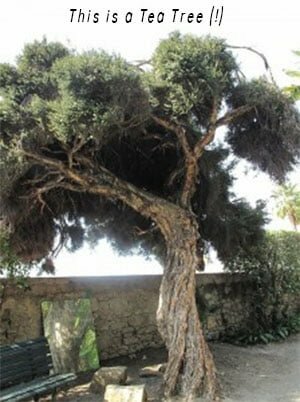 This already tells us that tea-tree compounds contain natural antibiotics – those wise people of the earth just knew that a long time before we westerners did! Use of the oil itself, as opposed to the raw plant material, did not become common practice until researcher Arthur Penfold published the first reports of its antimicrobial activity in a series of papers in the first half of the twentieth century. The name tea tree is actually used for several plants, mostly from Australia and New Zealand. The use of the name “Tea Tree” probably originates with Captain James Cook’s description of one of these shrubs that he used to make a hot drink in place of tea. …results of a study by U.S. researchers show that staph-infected wounds healed faster when they were treated with vapors of tea-tree oil than with conventional methods. Research published in December 2013 reported that a hand gel made with lemongrass oil was effective in reducing MRSA on the skin of human volunteers, and previous research has shown that a cleanser made with tea-tree oil clears MRSA from the skin as effectively as the standard treatments to which bacteria appear to be developing resistance. (Theatlantic.com). Abrasions and minor cuts: After cleaning the area well, apply a few drops of the oil directly. If a bandage is needed, allow a few drops of the oil to penetrate a cotton ball, then lay it face down on the wound with a bandage on top. Acne: Add a drop to your normal cleansing routine or dab a very small amount on acne breakouts. You can also add 20 to 40 drops of the oil to your regular face wash.
“Tea tree oil may be effective for acne. One clinical trial compared a 5 percent tea tree oil gel to a 5 percent benzoyl peroxide product for the treatment of acne and found that the benzoyl peroxide worked slightly better but that the tea tree oil had fewer side effects.” (National Center for Complimentary and Integrative Health). Air freshener: Keep a supply of cotton balls soaked in tea tree oil packed away in a plastic bag or tin. When confronted with foul smells from cooking, musty orders from dampness or even the medicinal smell in a sick room, take a few out to freshen the air and remove the nasty smell. Allergies: Use topically by massaging into the chest, abdomen or the reflex points of the feet. Arthritis: To help reduce pain associated with the swelling of arthritis, add 20 drops of tea tree oil to 2 ounces of carrier oil. Massage into affected areas two to three times a day. Asthma: Add a few drops of oil to a pan of water and heat on stove. When cool, drape a towel over head and breathe in for a few minutes. Athlete’s foot: Clean feet thoroughly, especially between toes. Add oil directly to feet every two weeks, dusting with cornstarch after. Or add 10 drops oil to 1 tablespoon of carrier oil and massage on feet and between toes daily. Baby care: Keep your diaper pail clean and fresh with a spray of tea tree oil mixed with water. Bacterial infections: Use topically, either massaging into the reflex points of the feet, adding several drops to a bath or cautiously applying over an infected site. Bad breath: Rinse mouth with 1 ounce water and one drop oil. Do not swallow! Bladder infection: In a shallow bath, add 10 to 15 drops of oil. Sit and wash area carefully. Blisters: Wash area carefully, then apply as for cuts and wounds. Boils: Apply a warm washcloth for a few minutes. Then apply a drop or two of oil to the area. The infection should rise to the surface and eventually be released. “For topical use only. 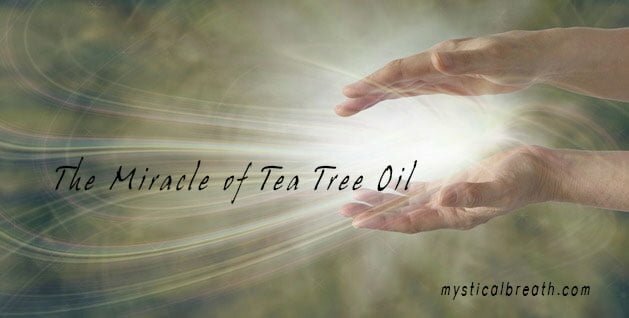 Tea tree oil must never be used in the eyes or swallowed. Even in small amounts, swallowing tea tree oil could potentially cause severe reactions, including severe rash, nausea, confusion, and coma. Given the lack of evidence about its safety, tea tree oil is not recommended for children or for women who are pregnant or breastfeeding.” (WebMD). Bronchial congestion: Use as directed for asthma. Add five to 10 drops to 1 ounce of carrier oil, and massage into chest and throat two to three times daily. Bronchitis: Add one or two drops to a pan of hot water and breathe in the steam, or massage the oil over the chest. Bruises: After icing, apply oil as directed for arthritis. Bunions: Massage area with 5 drops oil to 1 tablespoon of carrier oil. Burns: Run icy cold water on area. After a few minutes, add a mix of 5 drops oil with 1 teaspoon of raw honey. Repeat three to five times daily. Calluses and corns: Massage area with 5 drops oil to 1 tablespoon of carrier oil. Repeat 2 times daily. Once the corn or calluses have become soft, use tweezers to remove them. Then apply a few drops of tea tree oil and cover with bandage. Canker sores: Apply a drop or two of oil directly to infected area with a cotton swab, two times daily. Also, rinse as directed for bad breath. Carbuncles: Add a drop or two of oil to cotton swab and apply directly to carbuncle. Repeat twice daily. Chapped lips: Add one or two drops of oil to lip balm. Apply to lips as necessary. Chicken pox: Apply a drop of oil directly to blisters. Allow to dry, then dust with cornstarch. Repeat every few hours or until blisters disappear. Chigger bites: Apply a drop of oil directly to bites. Cold sores: Apply a drop or two of oil directly to the sore with a cotton swab. Reapply two to three times daily. Coughs: Use as directed for bronchial infections. For a vaporizer, add 10 drops to steamer and leave on five to 10 minutes. Dandruff: Add 20 to 30 drops of oil to any shampoo. Apply a few drops to scalp and massage after washing. Dermatitis: Add 10 drops of oil to 1 tablespoon of carrier oil and massage into affected areas. Repeat two to three times daily. Dry skin: Add 5 drops of oil to 1 tablespoon of sweet almond oil. Massage into skin. Earache and infection: Add 2 to 3 drops of oil to 2 tablespoons warm olive oil. With a dropper, drop a small amount into aching ear, tilting head to one side for a moment. Use a cotton swab to absorb oil. Repeat two to three times daily. Eczema: Add 10 drops of oil to 1 tablespoon of coconut or other carrier oil and massage into affected areas. Repeat two to three times daily. The oil also can be applied undiluted. “Infected skin wounds – scientists from the University of Wolverhampton, England, found that mixing tea-tree oil and silver greatly enhances their antimicrobial activity while minimizing side effects at the same time.” (MedicalNewsToday). Emphysema: Use as directed for bronchial infections. For a vaporizer, add 10 drops to steamer and leave on five to 10 minutes. Flea bites: Apply a drop of oil directly to bites. Gout: Add 10 drops of oil to 2 tablespoons of carrier oil; massage into affected areas two to three times a day. Gum disease: Create a mouthwash with purified water, 1 drop of peppermint and 1 drop of tea tree oil. Head lice: Add 20 drops of oil to 2 tablespoons of shampoo. Massage into scalp and hair and leave on for 10 minutes. Rinse. Repeat three to four times daily, until the eggs are gone. Hives: Add 10 drops of oil to 4 tablespoons of witch hazel. Apply with cotton ball. Or mix with coconut oil, which is naturally healing and soothing itself, and gently apply to the infected areas. Homemade mouthwash: Make a simple homemade mouthwash with purified water and tea tree oil. Household cleaning: Can be used aromatically or added to homemade cleaners to kill germs and prevent the spread of colds and flus. You can make a general tea tree cleaner by combining 2 teaspoons of tea tree oil with 2 cups of water in a spray bottle. Shake to blend and use for household cleaning tasks. This is especially good in the bathroom and in toilets. Immune system: To stimulate the immune system, diffuse through the air on a regular basis. Massage into the soles of the feet to increase your immune response. Infected wounds: Adding the oil to steaming water, hold the infected area over the steam. Or dilute 1 drop of tea tree with 1 cup of water and rinse the infected area one or two times a day, as needed. “Athlete’s foot – the topical application of a tea-tree oil cream for the treatment of athlete’s foot (tinea pedis) was examined in a study published in Australas J Dermatol. The researchers said that tea-tree oil cream (10% w/w) appears to reduce the symptomatology of tinea pedis as effectively as tolnaftate.” (MedicalNewsToday). Inflammation: Massage over the inflamed areas, gently and always toward the heart; or diffuse and inhale the tea tree oil directly or indirectly. Ingrown hairs: Add one to two drops of oil directly to area. Repeat every two hours or until signs of infection disappear. Insect repellant: Add 15 drops to a quart of water and use as an effective insect repellent. Jock itch: Apply 10 to 15 drops of oil to 2 tablespoons of carrier oil. Apply two times daily. Dust with cornstarch, to reduce chapping. Laryngitis: Add five to 10 drops of oil and pinch of sea salt to 1 cup of warm water, gargle two to three times a day. Do not swallow! Laundry helper: Add 1/2 teaspoon tea tree oil to your laundry for towels and other fabrics prone to getting moldy. Mildew and mold remover: Spray an all-purpose cleaner made with 2 teaspoons of tea tree oil and 2 cups of water on growing mold and mildew. Shake well before using and do not rinse. Mosquito bites: Apply a drop of oil directly to bites. Muscle aches and pains: Add 10 to 15 drops of oil to half a cup of Epsom salts and dissolve in the bath. Add 10 drops of oil to 2 tablespoons of carrier oil. Massage well. Mumps: Massage over the body and into the feet and diffuse through the home. Nail fungus: Add one to two drops of oil directly to nail and the surrounding tissue. Allow to dry completely on hands before touching anything. Repeat morning and night for a week. Pest control: Household ants and other pests dislike tea tree oil, so a few drops put at the point of entry will deter them. Wipe cupboards out with an oil and water solution to keep ants away. Plantar warts: Apply oil undiluted to affected area two to three times daily. Psoriasis: Add 10 drops oil to 1 tablespoon carrier oil and massage into affected areas. Repeat two to three times daily. The oil also can be applied undiluted. Rashes: Mix with coconut oil and massage over the affected areas. Rheumatism: To help reduce pain associated with rheumatism, add 20 drops of tea tree oil to 2 ounces of carrier oil. Massage into affected are two to three times a day. “High-quality tea tree oil contains 40% or more of terpinen-4-ol, the ingredient that fights harmful bacteria and fungi, making the oil effective in preventing and fighting infection. 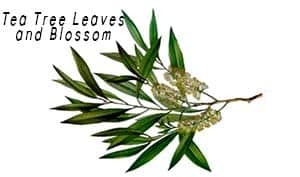 Tea tree oil may be useful in promoting the healing of damaged skin, such as with acne, cuts, scrapes, insect bites, and stings, as well as combating fungi and viruses that cause minor skin conditions.” (WholeHealthMD). Ringworm: Apply a drop or two of oil undiluted, repeat two times daily. You can also mix one drop of tea tree oil with one drop of lavender oil for added benefit. Rubella: Dilute as needed and massage into the affected areas. Scabies: Apply one to two drops of oil directly to area in the morning and at night. Sciatica: Add 10 drops oil to 1 tablespoon carrier oil and massage into affected areas. Repeat two to three times daily. The oil also can be applied undiluted. Seborrhea: For skin, add 10 drops of oil to 1 tablespoon of carrier oil and massage into affected areas. Repeat two to three times daily. For scalp, add 10 drops of oil to 2 tablespoons of shampoo. Massage into scalp and hair and leave on for 10 minutes. Rinse. Repeat three to four times daily. For a soothing bath, add 10 to 15 drops of oil to bathwater. Shingles: Add 10 to 15 drops of oil to half a cup of Epsom salts and dissolve in bath. Add 10 drops of oil to 2 tablespoons of grapeseed oil or coconut oil and massage well. Treat dandruff and head lice. According to one study, a 5% solution of tea tree oil is effective against Pityrosporum ovale, a fungus that can cause dandruff. In the study, 126 men and women with mild to moderate dandruff used either 5% tea tree oil shampoo or placebo daily for four weeks. The treatment group showed significant improvement in overall severity, as well as symptoms such as itchiness and greasiness compared to the control group.” (WholeHealthMD). Shock: Massage tea tree oil into the soles of the feet as needed. Sinusitis: Use as directed for bronchial infections. For a vaporizer, add 10 drops to steamer and leave on for five to 10 minutes. Sore muscles. Fill your bathtub with warm water. Add a few drops of tea tree oil to the water to relax tight muscles. Sore throat: Add 2 drops of oil to 1 cup of warm water with pinch of sea salt and gargle two to three times a day. Do not swallow! Staph infection: Best used topically, rubbed into the soles of the feet to increase the immune response and fight infection. Stye: Add five drops of oil to a pan of steaming water. Drape towel overhead and steam five minutes. Apply warm compresses directly to the stye. Sunburn: Mix 1 tablespoon of coconut oil with 1 drop of tea tree and 1 drop of lavender and gently apply to sunburned areas. Tattoos: Apply after tattoos to avoid infection. Use undiluted, diluted with coconut oil or as a spray with purified water. Thrush: Gargle with sea salt, warm water and 1 drop of tea tree oil. Ticks: Apply a drop or two directly to the tick and the surrounding area. Toenail fungus: Rub the tea tree oil directly onto the affected toenail and underneath the tip of the nail. Apply one to two drops of tea tree oil. Apply the oil once a day, preferably at bedtime. Toothbrush cleaner: Apply oil directly to toothbrush one to two times a week to kill bacteria. Tonsillitis: Inhale from steaming water with tea tree oil, gargle, and massage into neck and soles of feet. Vaginal infection: Add several drops to the bathwater. Viral infections: Diffuse tea tree oil throughout the home or inhale from steaming water. Warts: Apply undiluted directly to wart. Use morning and night, until wart begins to disappear. Dilute if necessary for sensitive skin. Wounds: Soak wounded area in water with tea tree oil, or spritz from a bottle of water with several drops of oil. Depending on the wound and your own sensitivity, you may be able to apply directly. The list above was uses facts and research from the site personal liberty.